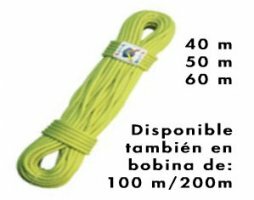 A semi-static rope for the more technical and demanding canyoning practitioners; for those who seek a rope wich is lightweight and manageable. Manufactured in high visibility colours wich make it asy to find, even under water. Dana 9 is constructed in such a way as to make it more highly resistant in fasr or long descents without producing burning. It is not necessary to soak this rope before use as it is factory-shrunk. From the spool straight to the rock face.